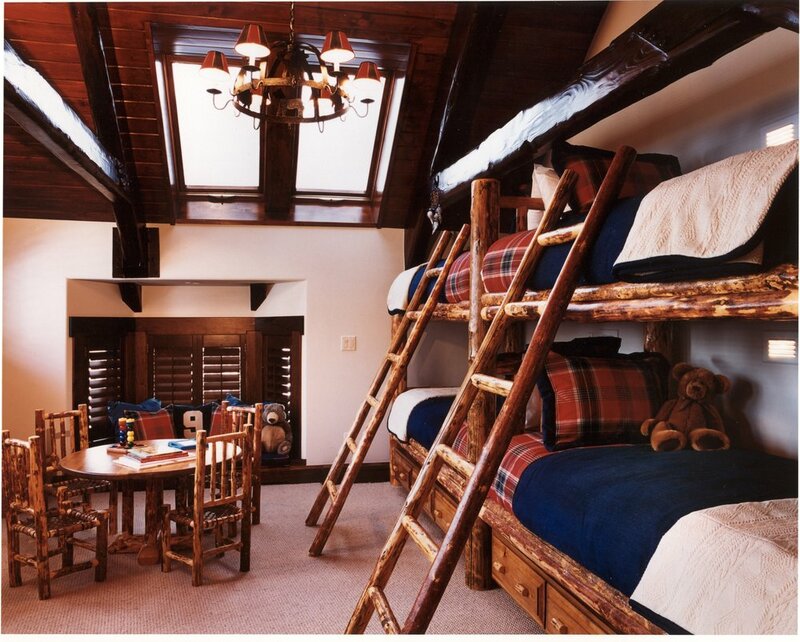 This was a full redesign of a ski-in/ski-out house right on the Vail ski slopes. The first floor of the house went through significant changes, including addition of a bathroom, removal of the rock facing from one of the dining room walls, addition of the ceiling beams and a complete remodel of the kitchen. The oak kitchen cabinets were custom-made for a warm country feeling. The chandelier installed in the dining room is an antique from a Scottish castle that we found in an antique store in New York City. In the first floor powder room we used warm colored grass cloth wallpaper for a natural but luxurious feel. Both the vanity and the mirror were custom pieces designed to evoke a sense of old-world luxury. We enlisted the skills of a local furniture maker who used native logs to build the furniture in the kids’ bunkroom. In the teen’s bunkroom, we maximized the space of the narrow room with custom-made storage bunk beds and installed mirrors to make the room feel bigger. The clients are wine lovers, so we dug out a wine cellar under the stairs to create a place to house their extensive wine collection. The entire home is filled with comfortable, plush and durable furniture, something that was an absolute must for the clients.